A large manufacturer of auto care products recently completed a 570,000-square-foot facility in Ohio. The new multi-million distribution center will be a hub of operations for the auto care company, bringing an estimated 350 new jobs to the area, and combining its logistics, manufacturing, and research and development into one facility. The facility required a new wastewater treatment system and three new 10,000 gallon horizontal UL-142 double-wall aboveground petroleum/chemical storage tanks that would ensure full compliance with local, state, and federal regulations. Highland Tank’s team of sales and engineering professionals offered assistance throughout the design, manufacturing, and delivery phases of this exciting project. The wastewater treatment system offered by Highland Tank consisted of 1-DSB (Deep Sump Basin) 4’ x 8’ coated carbon steel drainage sump. The sump is designed to collect the wastewater from daily operations at the plant, settle out solids and heavy oil, before pumping into a 4,000 gallon horizontal UL-142 double-wall aboveground wastewater storage tank located outside the building. 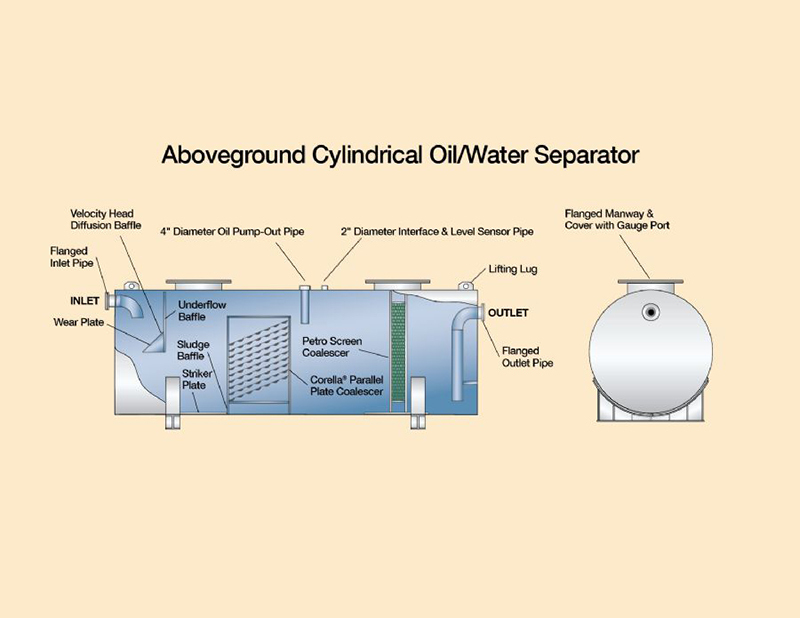 The 4,000 gallon storage tank allows for additional settling time for separation of contaminants before pumping into our HTC-1,000 gallon cylindrical double-wall aboveground oil/water separator. The engineers selected the Highland Tank Model HTC-1,000 gallon oil/water separator as the primary treatment vessel, designed for the treatment of contaminated wastewater from 0-100 gallons per minute, discharging with a certified effluent quality of 10ppm of free oil and grease. Highland Tank’s patented design combines state-of-the art technology with time-tested materials, making our separators the strongest and most reliable in the industry. It utilizes internal baffles and our patented Corella® Inclined Plates and coalescers to accelerate the oil/water separation process. Waste accumulates within the separator while effluent is discharged. The system is designed for access from above for observation, maintenance, and cleaning. The Highland Tank wastewater treatment system came with a complete control package to operate both the DSB sump pump and influent pump from the 4,000 gallon aboveground tank to the oil/water separator, emersion heaters for freeze protection on both the oil/water separator and 4,000 gallon aboveground tank, and an oil level monitoring system for efficient operation and maintenance. The oil level float sensor will sound an (audio/visual) alarm at high oil levels so waste can be removed from the separator tank by a waste oil pump. The monitoring system also has leak detection probes in both the wastewater storage tank and oil/water separator between the two walls of steel to further protect the environment from any discharges. The customer, with the use of Highland Tank’s products, has made every effort to ensure that safe storage of petroleum and chemicals along with water discharge from the new facility will offer no threat to the environment. To learn more about the Highland Tank Company and products please visit our website at www.highlandtank.com. Highland Tank & Mfg. Co.
next post: Highland Tank’s High-Quality HighDRO® Fire Water Storage Tanks — Don’t Get Burned!